Hi everyone. Welcome to the start of a new CAS Mix Up Challenge. 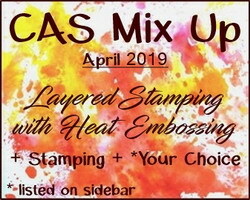 April we are looking for Layered Stamping with Heat Embossing. This month's host is Susan (Cat's Inkcorporated) and she has provided several video tutorials on the challenge blog to explain this fun technique. We are thrilled to have BozenA (ArtCardBox) as our Guest Designer this month. 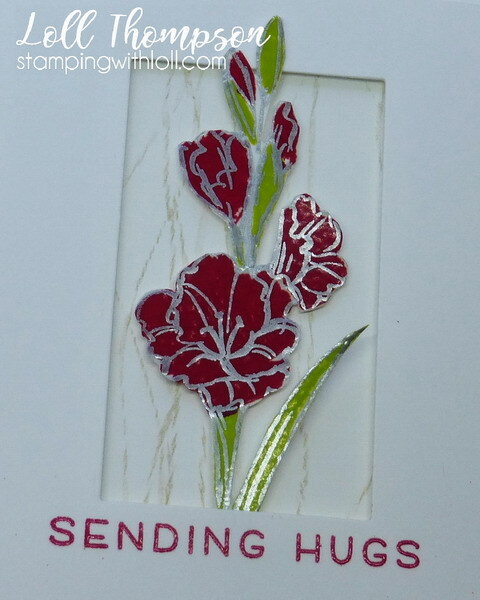 Please check out the challenge blog to see BozenA's beautiful layered stamping with heat embossing card ... and the amazing cards from our Designers. I decided I needed a bit of help, so I placed my outline image in my misted and stamped with antique linen distress ink. I then lined up my image in a second Misti that I have (or I could have used the stamp on blocks) with the leaves stamp, stamped with versamark and heat embossed the lime green. Repeated with the red flowers. And then finally, placed my card front back in my first Misti with my outline stamp. Used Versamark and silver embossing powder to create the outline. Each layer I added lots of anti static powder so that the embossing powders stayed where they should be. I fussy-cut the image and placed it over a simple lined background that I made with my brayer and a few rubber bands with tan ink. Very subtle, but adds a little something. Popped up a thick white frame over top, and also popped up my flowers on top. A simple sentiment heat embossed in red finishes the design. Happy with how this turned out. Come join us! Hope to see you in the gallery! Labels: AliExpress, CAS, CAS mixed media, heat embossing, Lawn Fawn, love, rubber band technique, Stampin' Up! The technique looks fabulous Loll and like you I learnt along the way with layering stamps. What a striking colour on the fabulous flowers, great fussy cutting, love the subtle background and the way you popped out some of the flower out of the frame looks wonderful x. Unique and beautiful card x. Beautiful flowers, Loll. Love the red and silver embossing. You did a fabulous job of this technique, Loll. It's one I'm hesitant to even try. This looks gorgeous in those wonderful colors. I can't get over the fussy cutting you are willing to do. I can see where lining it up would sure be difficult. Love these red flowers, Loll! The silver outline makes them very elegant. Love that subtle background too. It add that extra something special! Love the silver embossing powder for the outline! Such a perfect finishing touch! Great subtle rubber band background too! Oh, perfect details on your lovely card, Loll! Lovely subtle background with the lines and gorgeous outlined red flowers! Love your bold and beautiful flower spray Loll the red and green with the silver just pop! Your soft background finishes your card beautifully. A striking color contrast, I like it a lot. White card and so deep colors look great. Thank you for the description of the card. So much trouble, but the end result is dazzling. Beautiful shine of the silver embossing on the vibrant red flowers and the lime green leaves, Loll! 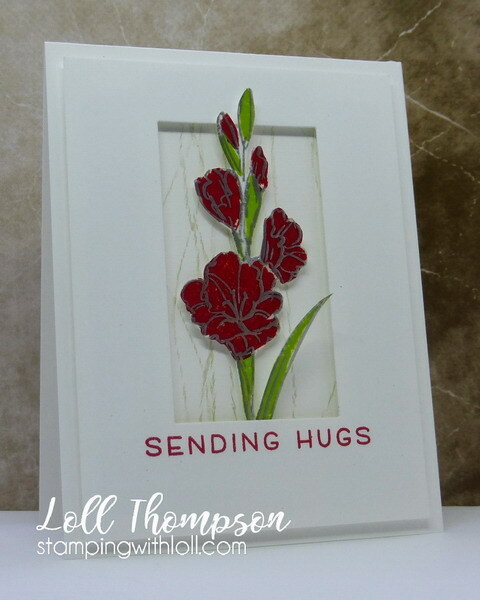 The rubber band background adds the right amount of interest (without distracting), and the wide frame strikes a perfect balance between the bold red flowers and the open white space! wow...so elegant and wonderful Loll...love the look. It sounds like a lot of work went into the flowers, Loll, but well worth it because they are beautiful. You have blown me away with this card Loll. Boldy bright and beautiful. Lovely soft background. That silver really outlines this flower so beautifully. I love those deep colors and such a unique background with rubber bands.